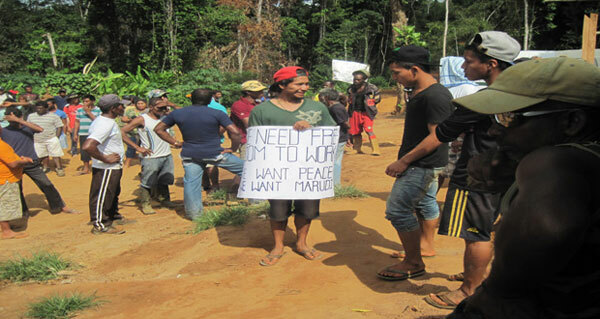 Marudi miners protesting eviction a few years ago from that Region Nine area. The Ministry of Natural Resources has re-committed to working with Region Nine miners get their operations up and running. The Marudi Mountain miners, as they are known, have been complaining that an agreement where new lands in Region Nine were allocated has not materialized. Scores of them have no way of earning a living. The miners have been complaining to the media in recent weeks. Over the weekend, a letter was penned to the media from the President of the Rupununi Mining Association. According to the ministry, it will be recalled that it was instrumental in the signing of a landmark mediation agreement among the different parties – the miners of the Rupununi including women miners, the Amerindian villages of the South Rupununi and Romanex Mining Guyana Limited on whose property the miners operated. The mediation agreement called on Romanex Mining Guyana Limited to conduct the necessary social and environmental impact assessments with a view to integrating the Rupununi miners and the concerns of the indigenous communities. The ministry noted that at the last mediation conformity meeting on Friday, September 8, 2017, it was said that in the apportioning of available lands, preference will be given to those individuals who were cooperating with the conformity process. “Finally, we ask that miners prospect the lands allocated before pronouncing on the geological viability of those lands, in the spirit of the agreement they signed in 2016. For its part, the Ministry will ensure that the GGMC supports the process of prospecting the lands to ascertain geological viability and will also be engaging miners shortly to discuss and agree on a way forward,” the ministry urged. The miners had clashed with the exploration company forcing authorities to step in.